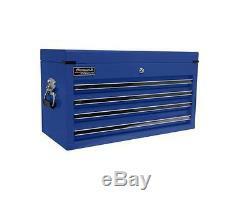 Professional 14.75-in x 26-in 4-Drawer Ball-Bearing Steel Tool Chest (Blue). 3.2-mil epoxy powder-coat paint finish. HMC high security tubular locking system with 2-keys. Top till for added storage. Basic - up to 400 lbs. 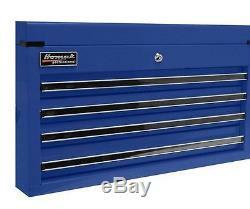 The item "Homak Professional 4-Drawer Ball-Bearing Slides Steel Tool Chest Blue Storage" is in sale since Saturday, March 17, 2018. This item is in the category "Home & Garden\Tools\Tool Boxes, Belts & Storage\Boxes & Cabinets". The seller is "homegoodsamerica" and is located in United States.